Baba ghanoush, tabouli, yebra and — welcome! 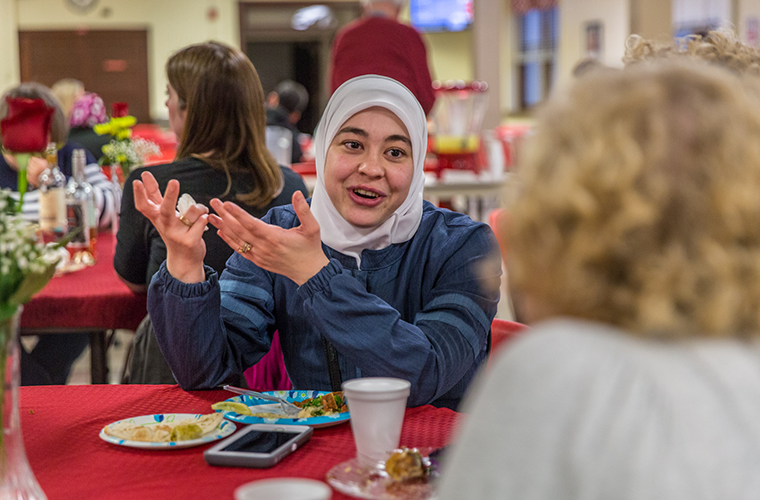 Ursuline Academy teacher Annie Hilmes spoke with Syrian refugee Mona Alfalah at a dinner club organized by Welcome Neighbor STL at Ursuline on April 22. Hilmes assists as a tutor with Welcome Neighbor STL, a group that supports refugee families who have recently settled in St. Louis. Asked to give a review of her meal, Lori Korn gushed in her praise. The baba ghanoush — a dish of mashed, cooked eggplant — “excellent, very smoky and delicious.” The tabouli — parsley, tomato and other ingredients in a cabbage cup — “very, very fresh.” And the yebra — meat and rice wrapped in grape leaves — “tender and tasty,” said the woman from Boston visiting family in St. Louis. Lina Almuallem talked with women during the Welcome Neighbor STL Super Club at Ursuline Academy on April 22. The meal wasn’t served at a restaurant but at the Ursuline Academy cafeteria April 22. The Supper Club dinner, arranged through Welcome Neighbor STL, was prepared by new refugee women using family recipes from Syria. Annie Hilmes, a French teacher at Ursuline and the other U.N. Women Club moderator, said the Supper Club event is a way of welcoming the Syrians into the community and was a natural connection with Ursuline. “Part of our core value as an Ursuline school is peacemaking and a commitment to social justice, which also is a core value of being a Christian,” Hilmes said. Proceeds from the Supper Club event benefit the refugee cooks. The club at Ursuline served as hosts, arranging the space and supplying some of the guests. The dinner also gave the Syrian women an opportunity to share a little about their lives and journeys. The cooks, with help from Susan Werremeyer of the Welcome Neighbor STL group, stood alongside the serving line and proudly explained the ingredients in the dishes. Some of the guests took photos of the food. Werremeyer, a 1987 graduate of Ursuline and member of St. Francis Xavier (College Church) Parish in Midtown St. Louis, introduced three of the Syrian women, including Lina Almuallem, a refugee from Damascus, who has lived in the United States almost two years. Almuallem told the group of the progress she’s made, the help she’s received from Welcome Neighbor STL and the cultural differences. With prompting from Werremeyer, she compared Americans’ overly scheduled lifestyles to Syrians’ emphasis on relationships. 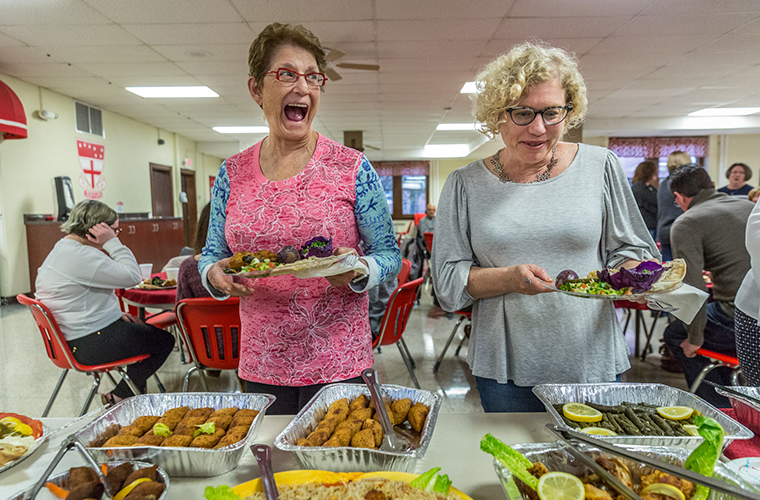 Judy Glaser and Amy Gage excitedly filled their plates with homemade Syrian cuisine at Ursuline. 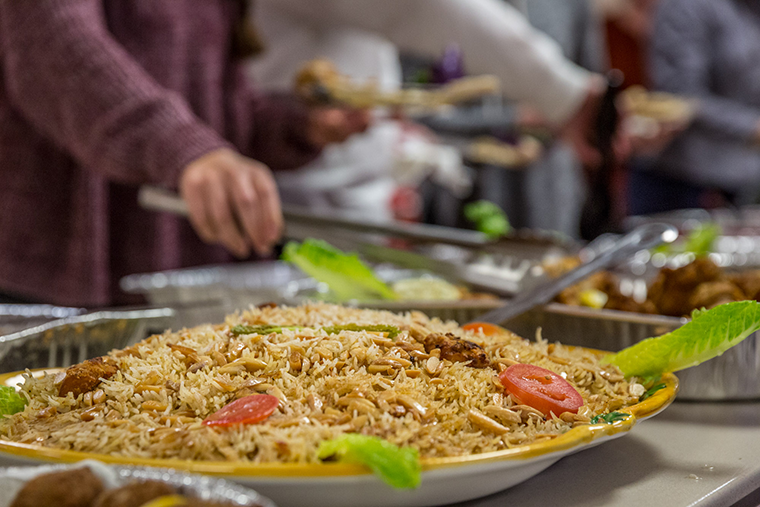 The meals were prepared by new refugees who cooked traditional food as part of the supper club to build neighborly connections with the refugees. Welcome Neighbor STL is a grassroots community support group for refugees and immigrants in St. Louis. The group matches volunteers with families, assists with English tutoring, helps families move from substandard housing, provides household items to those who need them and more. The refugee families generally have members who are working at least part-time hours. They are typically two-parent families with several children. Hilmes learned about Welcome Neighbor STL after joining with a group of other women, including another Ursuline teacher, Lisa Payne, to offer English lessons to Syrian refugees living in St. Louis. They were settled there through the International Institute. Jessica Bueler founded Welcome Neighbor STL after becoming concerned for their safety and health. The women Hilmes’ group taught eventually connected with the services provided by Welcome Neighbor STL and are now more independent, Hilmes said. Syrian refugee women prepared food for a supper club to benefit Welcome Neighbor STL, an organization that supports refugee families who are now living in St. Louis. Sophia Hilmes, Annie’s daughter and a junior at Ursuline, noted that she visits a Syrian family with her mom while her mom teaches English to them. “I just love this family so much and it makes me passionate to share their culture and help others see how special and unique their culture is,” she said. As a Catholic, she added, “we don’t treat people as outcasts. We bring them in and treat them with the respect they deserve,” Sophia Hilmes said. In school, she’s learning about human dignity and the right of people to live in peace. “I’m just glad we can come together in a safe environment to be able to share what they have to offer to us,” she said. Werremeyer explained that she was invited to get involved with Welcome Neighbor STL about a year ago and has made friends in the Syrian community. The area where the Syrians were living in St. Louis was just a few blocks away from her home in University City, Werremeyer said, but is plagued with crime and other problems. Welcome Neighbor STL seeks volunteers; financial donations to help Syrian refgees find safe living conditions in St. Louis; hosts for a Supper Club to build relationships and enjoy international cuisine while supporting local refugees; and donations of household, toiletry items and more. For information or to donate, visit www.welcomeneighborsstl.com.